After seeing StarsHollow‘s post about using the Blogger App, I thought I would give it a go! So here I am. I do prefer typing on a keyboard to on a touch screen but I’m not finding it too difficult. I wonder how easy it is to insert photos? Ooh, very easy, just a click on the image icon opens up your phone gallery. I inserted my last photo. 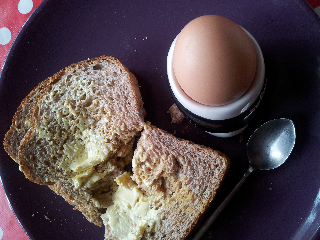 Boiled egg with toast! Very exciting! You can also click on the camera icon and take a photo to insert in the post. 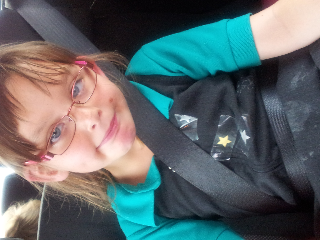 I just took a quick snap of Rebecca in the back of the car. I don’t know how to rotate her within this app! I can see how to use bold and Italic but not how to change the font. I think this App is very useful to write quick posts or to start the bulk of your writing on when you can’t get to the computer. I would probably then save the post and edit it, changing the font, replacing the photos and inserting unknown links on the computer before I publish it. For this post though I am going to just ‘touch’ PUBLISH and see what happens! What does a three minute post look like? !